mundane jane: Better than the bookmobile. You might be wondering what I'm doing with all my free time, besides making a spectacle of myself in the supermarket and working my way through college composition textbooks. Why, I've been reading fiction. And I've been getting it from paperbackswap, a free on-line book exchange. Sign up and enter the ISBNs of 10 books with which you could bear to part. (Well, okay--that part might not have been so easy.) You don't have to look up titles, or authors, or the mailing weight; that's all done automatically when you enter the ISBN. When someone requests a book that you have, you will receive an email from paperbackswap. Follow the links in the email, click on the button to print out the wrapper (with postage, if you choose), wrap up the book and put it in the mailbox to its happy new owner. You pay the postage on the books going out; someone else pays postage on books coming your way. You receive 2 credits for signing up, and a credit each time you send out a book. Use your credits to order books for yourself. 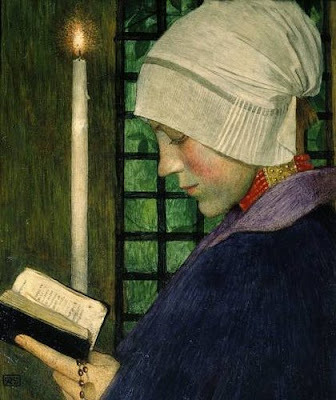 image, Candlemas Day by Marianne Stokes, 1901.
it's your kindle owning friend, i've been reading so much my eyes won't stay focused. love the kindle, but this book exchange sounds interesting. i still have a lot of paper books to read and share. I'll be signing up for this once we get back from the beach.